This Swordfish Shredder Oil Lubricant (240ml bottle) has a special micro-dispenser tip to make application easier, which also allows the bottle to be sealed after each use. To use, simply squeeze a wide zig-zag of oil onto a piece of A4 paper and then feed the oiled paper into the shredder. This ensures that the shredding blades get a good coverage of oil and will help to keep your shredder working optimally. 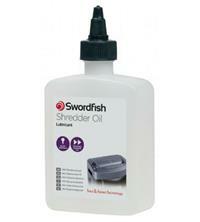 This 240ml bottle of Swordfish Shredder Oil can be used with all types of shredder.